Click to viewWe've been testing Leopard for over a day now, on multiple machines, and here are our full test notes and screenshots. The impressions below spare you the typical rehashing of features which you can get from our past coverage or Apple's website, and are focused on the nitty gritty details you'd find if you spent a long time poking at the big cat yourself. —Mirrored bottom dock is hard to see icons on, but it is pretty. Apps reflect off the dock. I prefer the side mounted launcher, but Stacks get crippled this way, disabling the fan mode. —The active window gets a larger drop shadow for emphasis. —Stacks are very limited in use. Long file names and largefile numbers render the grid useless, but icons thumbnails are good, and it's useful for folders with small numbers of files. —Automatic mode shows the arc for fewer files and the grid for more than a few. —Finding all sorts of files on my computer, like digital camera movies, that were lost in iphoto. —Toggled on and off with spacebar. —While on, you can continue browsing by hitting left and right arrows. Ultra useful. —Works for video, pdf, photos, documents. —Useful for images and videos as an inline Quick Look that shows you files ahead and behind the one you have selected. —I found that using two fingers to scroll sideways in Cover Flow on a MacBook Pro was hinky at best. —Backs up your entire hard drive first, which takes a good couple hours. Let it run overnight. —You can still use the drive as a regular drive. —There's a way to use Time Machine to swap your own hard drive in your Mac: you can mirror everything to the external drive, then swap out the drive in your Mac. Boot the Mac with Leopard DVD, and then select a Time Machine restore from the outboard hard drive. Haven't tested this, but I believe it will work. —Time Machine requires a back up drive that is larger, indeed far larger, than your computer's drive. —When you are in the System Pref Time Machine pane, you won't see a "Backup Now" function. —If you make changes——switch TM disks or change your backup options——a new backup will start within two minutes. But if you want to do a real "Backup Now" you have to go to the Dock, and CTRL—click the Time Machine icon. That's where the Backup Now option is. —Not too crazy about stationary. I just send plain emails, sorry dudes. —Also, so far I am frustrated by the Smart Mailbox features in Mail. Trying to make a smart RSS filter that looks at 20 feeds and picks relevant news based on a search criteria, but so far I can only get it to do either all of my mail and all of my RSS, or one given RSS source. Too big a net, or too small. Maybe I'm just missing something. —Too bad icons don't change between desktops. This is more to manage apps, but when you change spaces and the desktop icons stays the same, it's not as cool. —Wish I could use a giant wallpaper between all spaces. —Show image of the spaces menu, which makes it easy to know which desktop you are on. —Max of 4x4 spaces, for 16 total. —Can bind applications to a space. —Can jump between a Space with arrow keys or number keys. —Trigger Space by clicking on the icon on the dock or hitting a master hot key brings up all of the spaces. You can do expose here, or drag apps between space. —You can also click on an app and switch to a space using a hotkey and it'll drag the app with you. —iChat windows can be aggregated into a list with the names on the side. Text excerpts from new windows pop up over each person's name. —You can share files by dragging them into the video window, or display them over the video window using iChat Theater. —Music and video and images work, but images never show album art. —DRM files cannot be streamed, and you can transfer them but of course they won't play unless the other machine has permissions. iPhoto has a special relationship with iChat so you can run through albums. —Oh and playing music or video introduces a feedback loop as it streams the line signal and then the audio comes out all the machine speakers and back into the mic. —Video effects (also in photobooth) use 85% of a 2GHz machine's CPU. Is this acceptable? Maybe, since it is a real time greenscreening effect. —Make your own backdrops with avis and photos (Seems to like even big files, anything quicktime will play). Doesnt' work well under low light. 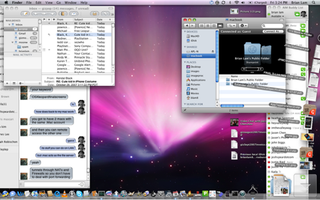 —iChat recording sticks a 320 x 240 MPEG—4 video in iTunes under iChat Chats, titled, "Video Chat with NAME"
—Photo Booth has the same effects as ichat, and you can save single shots, videos, and even a burst of 4 that go into a tiled grid or can be animated as a gif. Also, since the iSight captures in mirror, it has an autoflip mode that reverses each shot tyou take automatically. —Screen sharing activates voice. Big note comes up saying you are sharing, but there is no way to terminate from the host's. —Uses VNC tech, so you can also connect to windows machines and vice versa. —Wish you could zoom in or out, everything is 100% of what it would be in safari. —Movie widget is fantastic. Why did they wait til leopard to ship it? Uses Fandango. —I love that you can resize, rotate, and crop images here. Makes sense to add more functionality to preview since quick look is so good at previewing. —Finding shared iTunes sources took a little while. —Quite simply, back to my mac is most useful for screen sharing and file sharing. Same thing you can do on a LAN, but .Mac acts as a DNS server, so you can find your machines where ever they are, without typing in IP addresses. —.Mac account needed, but you should be able to screen share using an IP address and VNC protocol.